Our next meeting is March 19, 10:30 to noon at Peace Coffee in the community room on the right side, in the front. We will be reading the first section of the Transition Handbook – the section called The Head. It used to be online on a WIKI but appears to be removed. 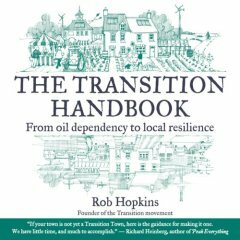 However, there is a PDF of the Transition Handbook online. There were 4 people at this meeting. I quite enjoyed it. The conversation was wide-ranging, from what to do if you lose your electricity for two weeks in a Minnesota winter (most people will lose their furnace or the blower to their furnace if their electricity goes out), to the opportunity to teach/learn about food storage methods for people who want to do more intensive home gardening but don’t know how to can or prep for freezing. A lot of the conversation was about local food, backyard gardening, where to share excess food, why CSAs sometimes don’t work so well. So here’s a question that came to mind from our food discussion: if we have a large increase in backyard farming, what will the effect be on coops and on organic farms that do CSAs? It seems to me the urban farmers are the same people who would have supported organic farmers and that by doing it ourselves, we may be undermining the type of healthy farming systems that we actually want to promote.